Join SCYP'N for an evening of wine, appetizers and painting @ Moya Art Gallery & Studio in Gilroy on Thursday April 25th!! 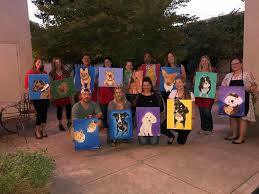 The first portion of the mixer from 5PM-7PM will be a paint night session. Registration is required to paint and only 30 seats are available so don't wait! The second portion from 7PM-830PM is OPEN TO EVERYONE and will be an After Hours Mixer with live music and refreshments in the courtyard area!